Two Cup runners among our four representatives on a busy Friday for the stable. Strike Force runs in the Wodonga Cup and Potemkin contests the Victorian Racing Industry Cup under the lights at Cranbourne. Strike Force (pictured) heads to Wodonga to try and win back-to-back Cups for the stable after Loyalty Man scored last year. Strike Force has pleased Mike Moroney since an unlucky last start when he was trapped wide in a small field at Geelong in the Ballan Cup. “He has bounced through his last run which you just have to put a line through as nothing went right for him last start, it happens sometimes,” Moroney said. “His work this week has been first rate and he comes into this race on the minimum weight and with a nice draw. Crafty Lion is the first to go when he runs in race three at Wodonga, the Maiden Plate over 1400m. Mike Moroney says the trip is likely to be too short for the lightly-raced son of Mastercraftsman. 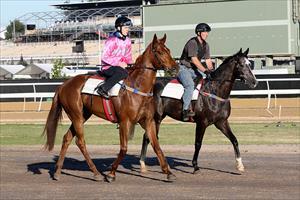 “He is in good order and has been working well but we think the 1400m will be too short for him,” Moroney said. Uber Cougar steps up to 2000m in race four at Wodonga and Moroney says the extra distance is in her favour. The daughter of Shocking has had two races in Australia since coming from New Zealand and Moroney is expecting a better effort. “The step up to 2000m will suit her and she’s been looking for it,” Moroney said. Potemkin runs in race six at Cranbourne, the TAB Victorian Racing Industry Cup over 2060m where he has drawn ideally in barrier two. “He has been up a while but we can't fault the way he looks and is working,” Moroney said. “I’ve always wanted to get him out to this trip and the way he finished off winning 1700m at Echuca last start I’m confident he will.